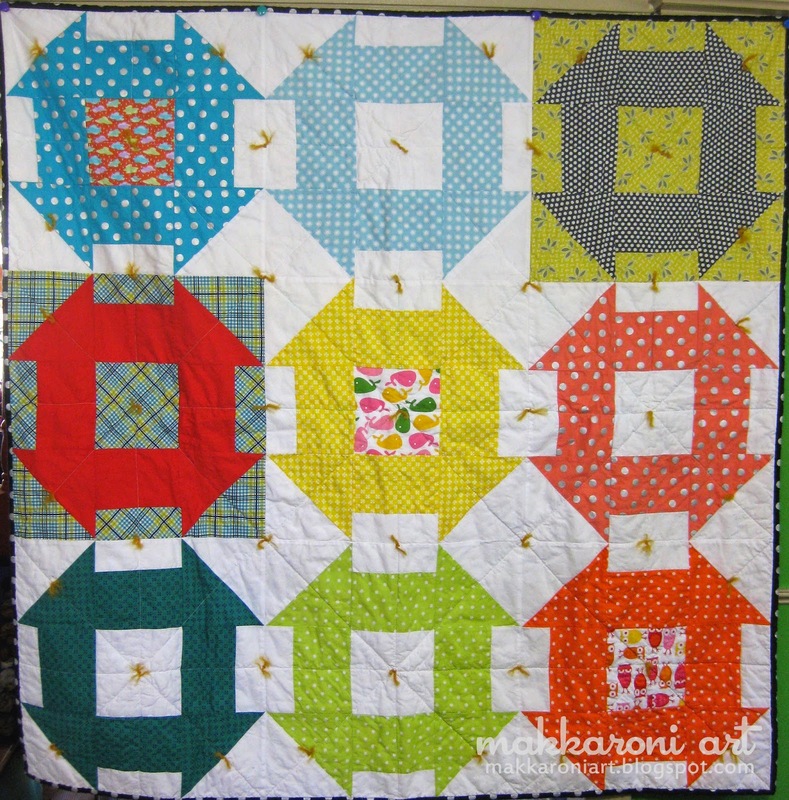 MAKKARONI ART: Quilts for the Triplets! 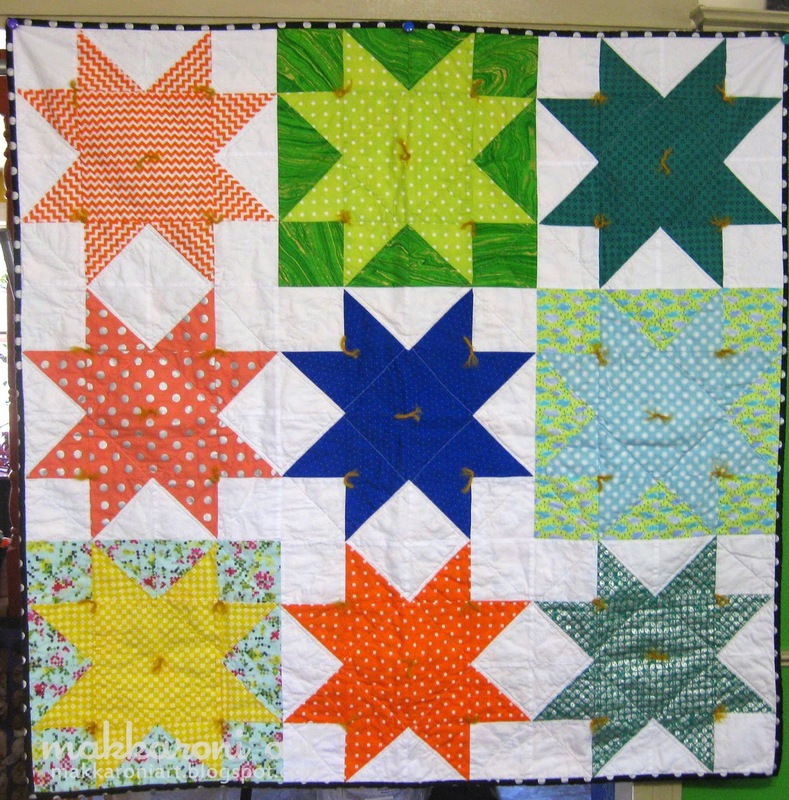 Back in March, I made three quilts for the triplets my sister and her partner were having. 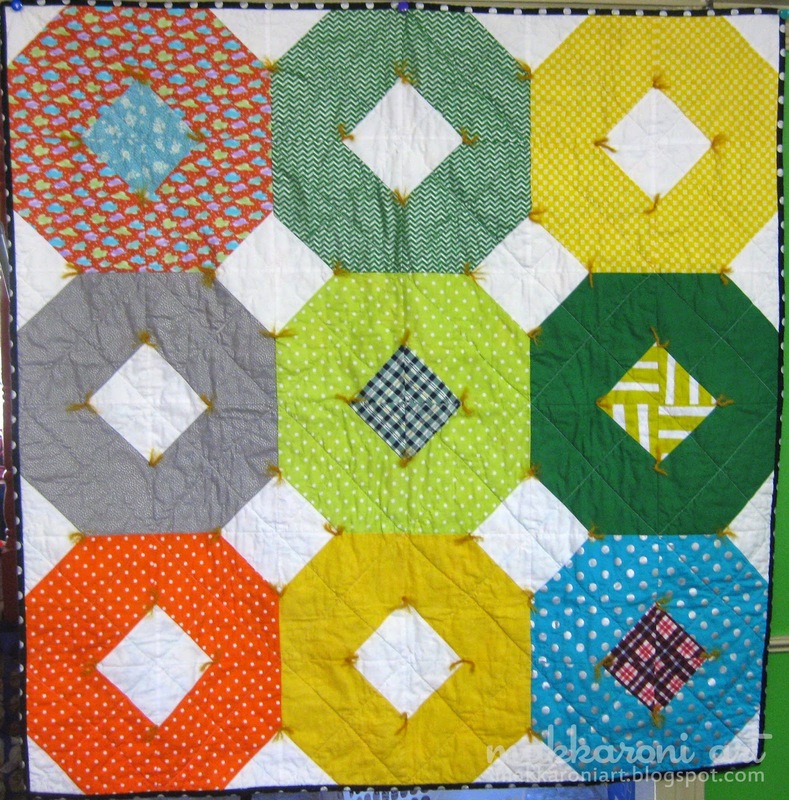 I posted some in-progress shots of making the quilts but no pictures of the finished pieces. Unfortunately, the pictures I did get were on the day I was shipping them out. And we were having some weather, so no lovely outside shots. The tops were made before we knew the sexes of the babies, so I went with (what I consider) gender-neutral fabrics and colors. I am pretty happy with how they turned out! 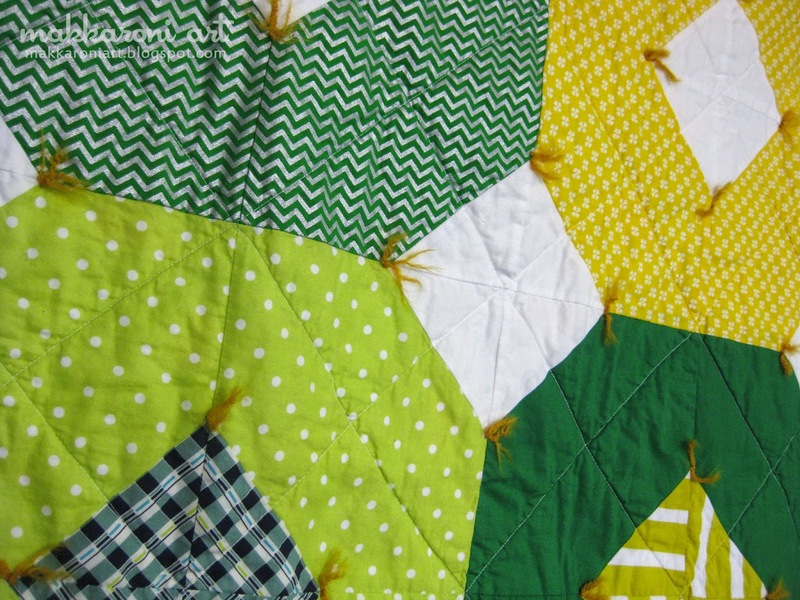 I machine quilted them with cotton thread in straight lines, following the flow of the block seams. I wanted to add a little texture, so I tied all three with the same golden yarn. It was a wool mix, and got a little crazy after the final wash. I was hoping they would felt more after the wash, but nope. Definitely need to keep trying different yarns for tying. I do still like the pop of color and texture. I backed them in a mix of fun and colorful flannel fabrics, but I didn't get any good shots of the finished backs! 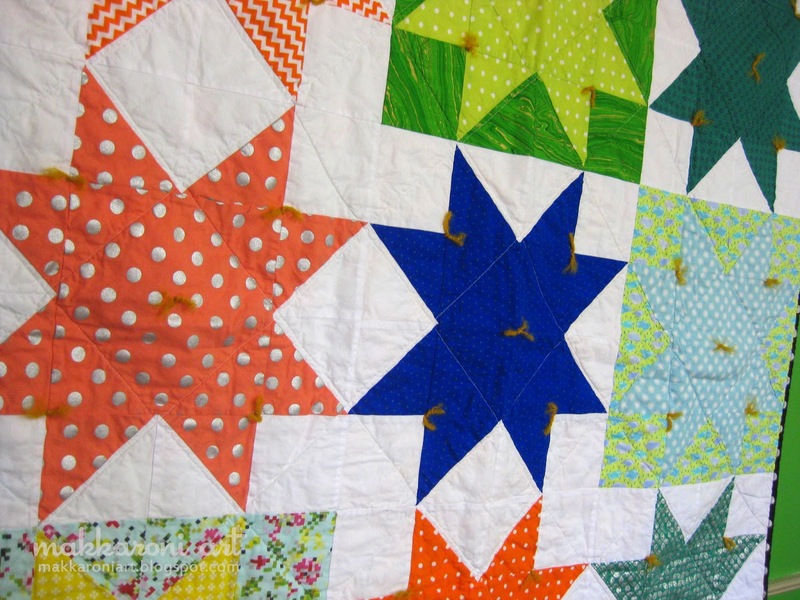 I used about 5 or 6 different flannels and pieced them in big stripes for each quilt. You can see a few of them in the last picture in this post. After I finished the tops, but before I pieced the backs and quilted the quilts, my little nephews and niece were born premature and spent almost 3 months in the NICU, but all three are now home with their mommies! Yup, two boys and a girl. They are the cutest little things...though they aren't so little now and are getting bigger! Nothing better than chunky, roly-poly babies! 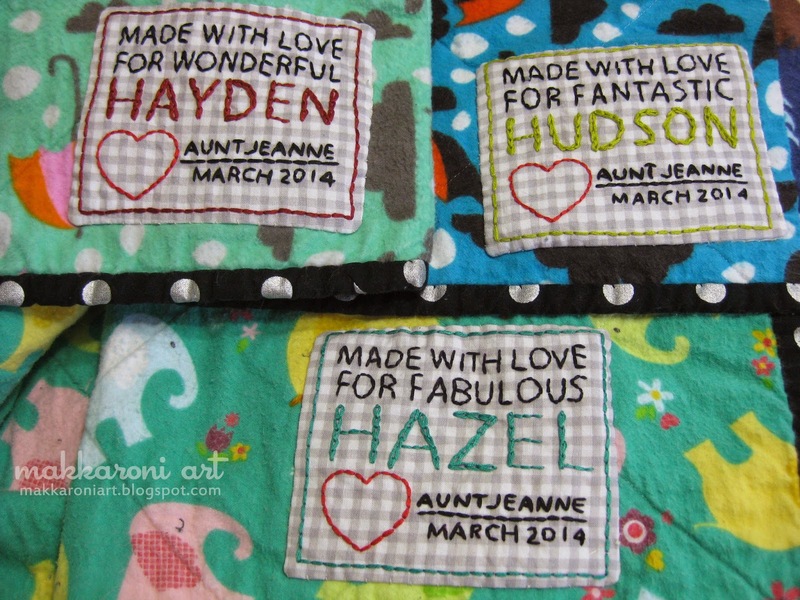 Here are the quilt labels I was able to make, since I knew their names before I finished the quilts. I designed the labels on my computer and them printed them out in the approximate size I wanted to make them. I turned the paper over and copied the labels with an iron-on pencil for transferring embroidery patterns. Then I ironed them on to the gingham and started embroidering. I can't wait to meet them! 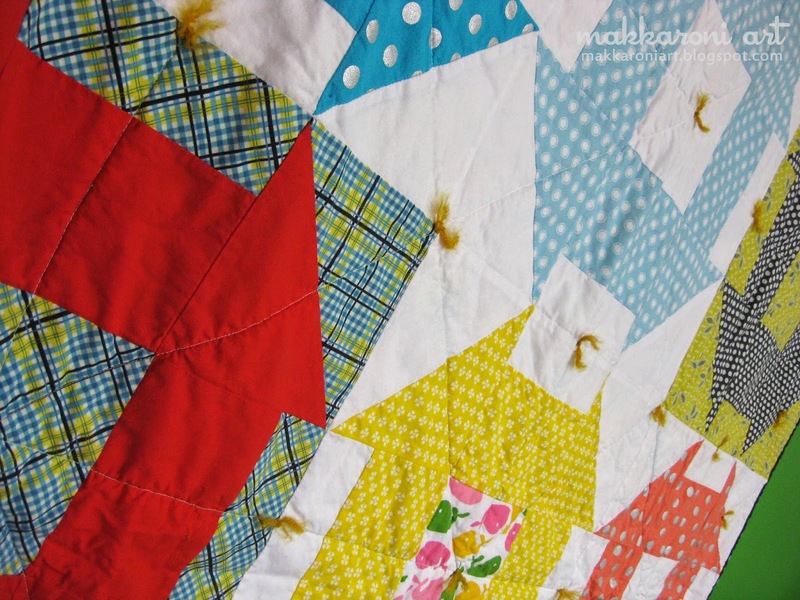 And see them with their quilts (which I hope they will cherish as much as I did making them). Thanks for stopping in. Have a great day!